Price depends on your choice of accommodation and need for transfers and bike hire. Please phone or e-mail to let us know your requirements and we'll provide a quotation. The Beaujolais region, located to the north and east of Lyon, is a series of rolling hills summiting around 1000m above sea level. Despite the relatively gentle nature of their slopes, the scale of the peaks and the depths of the valleys create a landscape of great panoramas and rich contrasts. The character of the hills changes with altitude as the vines give way to forests and fields on the higher slopes. The trails are divided between two areas (and guide books), north and south of Beaujeu. The trails explore the full diversity of landscapes in both areas. They are easy to follow by the use of the official way-marks of the Federation Française de Cyclisme. South of Beaujeu, you'll find an area consisting of 37 trails with roughly an equal split between the grades. 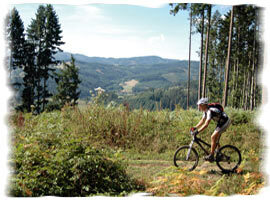 The trails pass from the vineyards onto the lofty ridges and peaks, offering great views across a rich landscape. For the more sporting there are several challenging climbs among the higher grades, which will test even the fittest. The area north of Beaujeu has a similar number of trails, although on average, they are longer and tougher than further south. Over 1500 Km of circuits await to be discovered in this small upland area alone, not only allowing you to bike on some great trails, but also to discover the varied and picturesque Beaujolais landscape. A hearty and healthy continental breakfast providing the perfect opportunity to discover the local specialities such as home-made jams and local cheeses. At midday you will eat packed lunches prepared by your hosts, so that you can refuel between trails without having to travel away from the area. Evening meals will be taken at your guest house with your hosts, where you will be treated to local delicacies. You may choose to eat out for some meals in a local restaurant where you will have a choice of menus. Your host will be delighted to recommend a restaurant to suit your tastes. 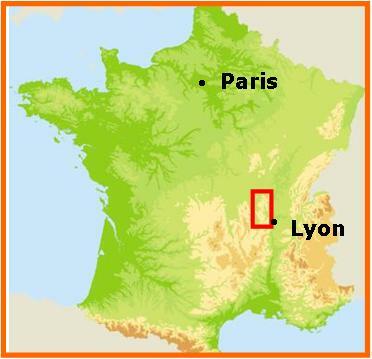 Most car hire companies operate out of Lyon Airport. Here are a few links. Transfers from Lyon St Exupery and Lyon Part Dieu. Once in France, the journey from Calais to the Lyon area takes about 7-8 hours (excluding long breaks). Tolls amount to about 30 euros each way. Controlled parking is available at the airport for 50 euros. Channel crossings are provided by the following companies.